The first English translation of an important German novel, first published in 1953, whose pointillist complexity offers a searing image of postwar Germany on the perilous threshold of partition and possible rearmament. Virtually forgotten today, Koeppen (1906–96) was an expatriate member of the literary generation immediately preceding that of Heinrich Böll and Günter Grass, whose self-exile from Hitler’s Germany made him a prophet without honor in the country to which he returned after the war, living out the rest of his long life in undeserved obscurity. Though he published nothing after 1954, Koeppen is remembered for the so-called “Postwar Trilogy” that includes (his previously translated novels) Pigeons on the Grass and Death in Rome—and the present one: a meticulously observed chronicle of the last two days in the life of Keetenheuve, a Socialist Peace Party member of the Bundestag (Parliament) who, despairing over his countrymen’s amoral consumerism and reflexive drift toward militarism, finds he cannot survive in the “hothouse” atmosphere of Bonn, a capitol city sunk in the mire of getting and spending. Most of the story is keyed to Keetenheuve’s tormented psyche, and Koeppen produces numerous spectacular stream-of-consciousness passages—notably, the account of a long stroll through Bonn’s crowded mean streets, which triggers the bitter (and inevitable) hallucinatory ending. 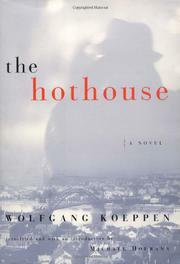 But The Hothouse isn’t hermetic: its flexible structure gracefully accommodates flashbacks illuminating its protagonist’s neglect of his weak-willed young wife, equally guilt-ridden love-hate relationship with his culture, and complex relations with colleagues who embody a spectrum of allegiance and resistance to the lingering phenomenon of Hitler’s “revolution.” This rich brew of history and psychological portraiture, further seasoned by subtle allusions to Teutonic myth and literature, is made fully accessible by Hofmann’s fluent, resourceful translation. A rediscovered masterpiece. Norton is reissuing Koeppen’s Death in Rome to accompany it. Let’s hope a new edition of Pigeons on the Grass will follow soon thereafter.